United States' Michael Phelps walks with his national flag during the medal ceremony for the men's 4 x 100-meter medley relay final during the swimming competitions at the 2016 Summer Olympics, Aug. 14, 2016, in Rio de Janeiro, Brazil. American swimming sensation Michael Phelps has won his 23rd Olympic career gold medal, and 5th of the Rio Games, in what may be the final race of his Olympic career. The most decorated Olympian in history swam the third leg of the 4x100-meter medley relay, coming from behind to pass Britain and give the U.S. the lead going into the final leg. The first leg of the relay, the backstroke, turned out to be a world-record time by American Ryan Murphy, and that pushed the U.S. team toward an Olympic record time for the complete race. The U.S. women's 4x100-meter medley relay also won gold Saturday - the nation's 1,000th gold medal in Summer Olympics history. And on the final day of swimming competition in Rio, Italy's Gregorio Paltrinieri earned gold in swimming's most grueling race - the men's 1,500-meter freestyle. Connor Jaeger of the U.S. took silver. Earlier, Pernille Blume of Denmark held off American Simone Manuel to win the 50-meter freestyle. Denmark's Pernille Blume reacts after winning the women's 50-meter freestyle final during the swimming competitions at the 2016 Summer Olympics, Aug. 13, 2016, in Rio de Janeiro, Brazil. On the track, Jamaican Elaine Thompson took gold in the women's 100 meters in 10.71 seconds, ending a bid by her countrywoman, Shelly-Ann Fraser-Pryce, to win the sprint event at three straight Olympic Games. American Tori Bowie took silver, just ahead of Fraser-Pryce. The long jump crown went to American Jeff Henderson, earning the gold on his sixth and final jump, winning the event by 1 centimeter. British runner Mo Farah was tripped by American training partner Galen Rupp on the 10th lap of the men's 10,000-meter race, but recovered to successfully defend his Olympic title. In the heptathlon, Belgium's Nafissatou Thiam beat out defending champion Jessica Ennis-Hill of Britain in a competition that went down to a matter of seconds in the last event. 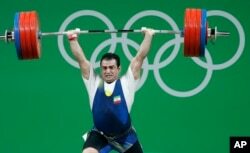 Elsewhere in Rio, Iran's Sohrab Moradi took gold in men's 94-kilogram weightlifting - the country's second weightlifting victory in two days - and Russia won its fourth fencing gold, crushing Ukraine in the women's team sabre event. Sohrab Moradi, of Iran, competes in the men's 94kg weightlifting competition at the 2016 Summer Olympics in Rio de Janeiro, Brazil, Aug. 13, 2016. Puerto Rican tennis player Monica Puig won the first Olympic gold medal for the U.S. territory in any sport Saturday, beating Germany's Angelique Kerber at women's singles Saturday at the Games in Rio de Janeiro. The outcome was an upset; Puig was unseeded, while the second-seeded Kerber won the Australian Open in January and was runner-up at Wimbledon in July. Muslim-American Ibtihaj Muhammad, the first U.S. Olympian to wear a hijab during competition, won a bronze medal in the women's team sabre event, as the U.S. beat Italy, 45-30, to clinch third place and the first women's medal in fencing for the Americans in Rio. Meanwhile Russian long jumper Darya Klishina is fighting her suspension from the games, saying the doping allegations against her are politically motivated. Russia's long jumper Darya Klishina speaks at the National track and field championships at a stadium in Cheboksary, Russia, June 20, 2016. Previously, Klishina had been the only Russian track and field athlete exempted from a blanket ban on Russian-trained athletes implicated in a state-sponsored doping scandal. Klishina has trained the past three years in the U.S. state of Florida and was subjected to non-Russian drug tests. But reports say her name has surfaced in a lawyer's report on the scandal, putting the International Court of Arbitration for Sport under pressure to rule on her case before the long jump competition starts Tuesday. Day nine of the Rio Games Sunday features the title of the world's fastest man when Jamaican sprinter Usain Bolt - the world record holder - goes for an unprecedented third straight gold in the 100 meters, despite a sore hamstring. Jamaica's Usain Bolt, center, Trinidadand Tobago's Richard Thompson, right, and Britain's James Dasaolu compete in a men's 100-meter heat during the athletics competitions of the 2016 Summer Olympics at the Olympic stadium in Rio de Janeiro, Aug. The 400-meter finals will also take place on the track. Triplets will compete for the first time in Olympic history when the Luik sisters from Estonia run the marathon. Gymnastics features the women's vault, uneven bars and pommel horse. American all-around champion Simone Biles goes for her third gold medal in Rio, competing in the vault. The men will decide gold on the floor exercise. Other final events will take place in tennis, golf, boxing, fencing, track cycling, diving, sailing, shooting and weightlifting, as 22 gold medals are up for grabs Sunday.